On 24 July, the government published a White Paper - Legislating for the Withdrawal Agreement between the United Kingdom and the European Union. The paper sets out the government's current thinking for a European Union (Withdrawal Agreement) Bill to be introduced in the autumn IF there is a Withdrawal Agreement which Parliament has accepted. The similarly named European Union (Withdrawal) Act 2018 section 13 specifies the requirements for Parliamentary acceptance of any withdrawal agreement and framework for the future relationship. The 5 Chapters of the latest White Paper concentrate mainly on the parts of the draft Withdrawal Agreement agreed in March 2018 - (1) Introduction - (2) Citizens' Rights - (3) The Implementation Period - (4) The negotiated financial settlement - (5) Procedures for approval and implementation of the Withdrawal Agreement and framework for our future relationship. The Draft Withdrawal Agreement (March 2018) - shows in Green material agreed at negotiator level. Yellow shows areas where there is an agreed policy objective but detail remains to be agreed. White shows proposed text where no agreement existed at the time. Negotiations are on-going and in its White Paper of 12 July the UK government put forward its proposals - The future relationship between the UK and the EU. The latest "State of Play" in the negotiations was outlined by Michel Barnier and Dominic Raab in statements of 26 July in which is is indicated that the aim is to reach an agreement by October. The government is confident that it is in the interests of both sides to reach a deal and so anticipates a successful conclusion of the negotiations. Negotiations are also taking place to achieve agreement on the Future Framework alongside the Withdrawal Agreement. The Bill will be the primary means of legislating for the Withdrawal Agreement. The UK's future relationship with the EU cannot be concluded until after the UK has left the EU and so that will be implemented as necessary in separate legislation. The draft Withdrawal Agreement contains provision for a "Joint Committee" of UK and EU representatives to oversee and discuss the implementation and application of the Withdrawal Agreement. The UK government does NOT expect that setting up the committee will require implementing legislation. I have commented on this before and noted that the Joint Committee shall, for the purposes of the Agreement, have the power to adopt decisions and make appropriate recommendations to the EU and the UK. The decisions adopted by the Joint Committee shall be binding on the EU and the UK and the EU and the UK will be bound to implement them. Such decisions shall have the "same legal effect as this Agreement." The Joint Committee will clearly be very powerful given its power to bind the EU and the UK. Agreement on the Rights of Citizens was reached in December 2017 and is set out in Part Two of the Draft Agreement (March 2018). The rights agreed in the Withdrawal Agreement are without prejudice to the reciprocal rights of British and Irish citizens in each other's countries as associated with the Common Travel Area arrangements between the UK and Ireland. Those arrangements pre-date UK/Irish accession to the EU. All UK nationals lawfully residing in a Member State by 31 December 2020 will be able to stay, as will all EU citizens lawfully residing in the UK. The Statement of Intent 21 June 2018 sets out the detail of how this will work in the UK. The Withdrawal Agreement protects the existing rights to equal treatment and non-discrimination for EU citizens residing or working in the UK, and for UK citizens residing or working in the EU and, in both cases, their family members. There will be continued recognition of professional qualifications for those resident in a host member State and for frontier workers. After the implementation period, there should be a system for the mutual recognition of professional qualifications, enabling professionals to provide services across the UK and the EU. The agreement reached between the UK and the EU on social security coordination means that for EU citizens living in the UK and UK nationals living in an EU member State at the end of the implementation period, social security rules will continue to apply in full for as long as they remain in scope. The Bill will introduce overarching protections for citizens' rights. Rights conferred on individuals by the Withdrawal Agreement will take precedence over any inconsistent provision in domestic law. The Bill will make provision to ensure that the withdrawal agreement, including EU law underpinning it, is interpreted consistently in the EK and the EU. For 8 years after the implementation period, UK courts will be able to make a reference to the CJEU in relation to the citizens' rights agreement. A UK court will have to consider that it is NECESSARY for there to be a reference so as to be able to give judgment in the case. The CJEU will only be able to provide a ruling on the interpretation of Part 2 of the withdrawal agreement, rather than deliver judgment on the case itself. UK implementation of the citizens' rights agreement will be monitored by an independent authority to be established by the Bill. Its powers will take effect from the end of the implementation period. This body will have power to receive complaints from citizens and take appropriate action if it is decided that there has been failure on the part of the authorities to implement the terms of the withdrawal agreement. At the end of the implementation period, the current application of common rules will come to an end, as will the existing arrangements under which EU law applies in the UK. During the implementation period, there will be common rules across the UK and the EU. This means that EU law will continue to have effect in the UK in the same way as now for this 21-month period. New pieces of directly applicable EU law that are introduced will continue to apply automatically within the UK; other new EU measures introduced during the implementation period will need to continue to be implemented domestically. Directly applicable EU law will continue to function in the UK during the implementation period, through the save effect of section 2(1) of the European Communities Act. Some provisions in the EU (Withdrawal) Act 2018 will not be needed until the end of the implementation period. The Bill with therefore amend the 2018 Act so that conversion of EU law into 'retained EU law', and the domestication of historic CJEU case law, can take place at the end of the implementation period. Section 8 of the 2018 Act will be amended so as to expire on 31 December 2022. During the implementation period, existing EU mechanisms for supervision and enforcement will continue to apply to the UK. This will ensure that EU rules are interpreted and applied consistently in the UK and the EU. The role of the CJEU will be preserved during this period and this will be facilitated by amendments to the 2018 Act so that sections of that Act which end the jurisdiction of the CJEU in the UK take effect at the end of the implementation period. UK and EU have agreed that representatives or experts from the UK will be able to continue to attend certain Commission-led EU meetings. This ongoing participation is unlikely to require any provisions in the Bill. Continued participation in international agreements will be provided for in the Bill. Further, the Withdrawal Agreement states that the UK will be free to negotiate, ratify and sign international agreements - including trade agreements - during the implementation period. (The White Paper does not mention the lengthy timescales normally needed for negotiation of trade agreements). EU fisheries policy will apply during the implementation period. In 2020, the UK will be negotiating fishing policy as an independent coastal State. A Fisheries Bill will be introduced. UK will be able to choose whether to participate in additional Justice and Home Affairs (JHA) measures and Schengen measures. The UK can also be invited to co-operate in relation to entirely new measures. A reasonable estimate of the size of the settlement is £35-39 billion. On the basis of Office for National Statistics data for 2016, the NET contribution by the UK to the EU was in the region of £9bn. The settlement therefore appears to be in the region of 4.5 times the 2016 net contribution. Crucially, the financial settlement does not cover costs that might be associated with the UK's future relationship with the EU. The settlement has been put forward by the UK on the condition of an overall agreement under Article 50 on the UK's withdrawal - see Joint Report 8 December 2017. (This is the document in which it is stated that 'Nothing is agreed until everything is agreed'). The financial settlement has three components - amplified by the White Paper at paras. 111- 123. A specialised committee on the financial provisions will be put in place. The Bill will make provision for payments to the EU which become due under the financial settlement. While the amounts to be paid will vary and are a function of the settlement, the Bill will only allow payments to meet financial commitments that are required by the Withdrawal Agreement. This finance authority will not be able to be used for payments relating to any future agreements between the UK and the EU. The Bill COULD - (the White Paper does not say WILL) - include a requirement on the government to provide regular updates on payments over the past year and on forecast payments and receipts to and from the EU. Not without irony the White Paper then states - "This would provide a greater degree of transparency than has existed with payments made during our membership." The steps to be taken to secure withdrawal are set out in Chapter 5 and see this previous post. Three parliamentary processes must take place by exit day. a) A Vote in favour of accepting the Withdrawal Deal - this requirement is in the European Union (Withdrawal) Act 2018 section 13.
b) A new EU (Withdrawal) Bill to be introduced as soon as possible after (a). All of the foregoing depends on there being a Withdrawal Agreement. Whilst much has been agreed, sticking points remain including the question of borders with and within Ireland. The European Parliament’s Brexit Steering Group insist that the withdrawal agreement must include a viable backstop for the Northern Ireland - see HERE - and it must be borne in mind that the European Parliament has to approve the Withdrawal Agreement. "At Westminster, the July debates revealed no majority for a Chequers soft Brexit. There’s also no majority for a deliberate hard Brexit, though accidents can happen. We know that this parliament won’t vote for no Brexit, overturning the 2016 result. Hence the deadlock. To break it, parliament could, and in my view should, insist that the people be consulted again, given the new facts. 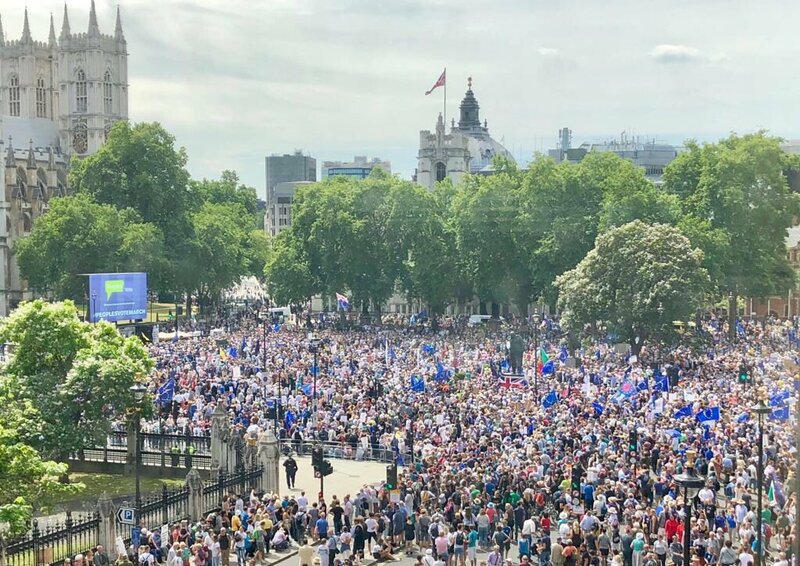 Democracy didn’t end in 2016, and much that the Leavers then promised had turned out to be unobtainable.